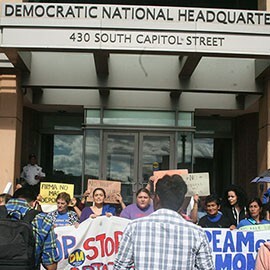 WASHINGTON – Two Arizona women were among those arrested Monday at the Democratic National Committee’s headquarters where protesters chided President Barack Obama’s “broken promise” to take action on immigration reform before the end of this summer. The roughly two-dozen protesters – including 12 from Arizona – timed their demonstration to coincide with the first day of fall. Congress is on recess until after the elections, but organizers said they were targeting Democratic leaders, who they said are “playing political games” rather than passing comprehensive immigration reform. Chanting “Obama, Obama, don’t deport my mama,” “Si, se puede!” and other slogans outside the DNC, protesters spoke before moving to a nearby intersection where four women sat in the middle of the street. 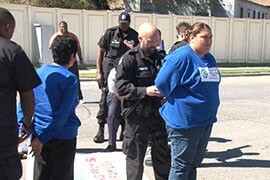 After about two hours, officers gave the women a chance to move or face arrest. When the women refused to move, they were cuffed and loaded into a van as the remaining protesters cheered and continued chanting. One of those arrested, Mayra Canales of Mesa, is a legal permanent resident whose undocumented husband sought sanctuary in an Arizona church two weeks ago to avoid being deported. Canales said that despite his having no criminal background, her husband faces imminent deportation. She criticized Obama and immigration officials for repeatedly saying that people of good moral character and no criminal background will not be deported. The protesters said they wanted to highlight their disappointment that Obama – who had promised to take executive action by summer’s end – announced two weeks ago he would delay any policy changes until after this fall’s elections. “I’m here as a Latina, as a citizen and an immigrant,” she said before her arrest. Adum and other protesters said they are fed up with political inaction in Washington, which they said threatens families facing separation from loved ones who are deported. In response to Monday’s protest, DNC spokeswoman Pili Tobar blamed Republicans for the lack of progress on immigration reform. “Democrats want to see a stop to family separation and the passage of immigration reform, but Republicans … and their allies have fought administrative relief at every turn,” Tobar said. 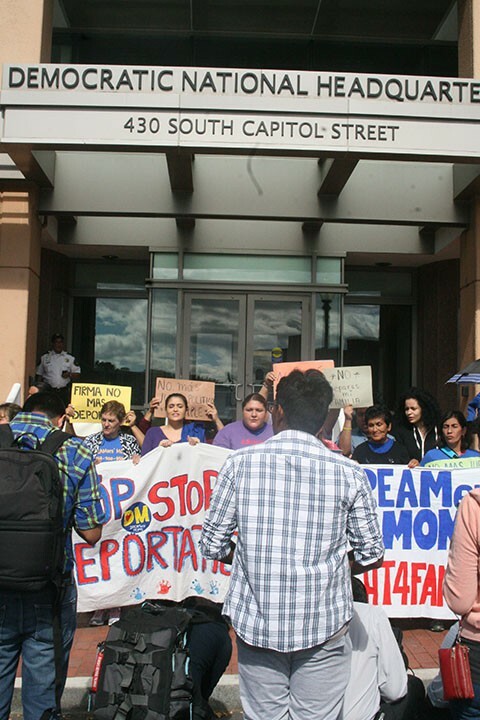 Members of two Arizona immigration advocacy groups, the Original Dreamers and Arizona Dreamers Guardians, were there to support Adum and Canales as they faced arrest. One of them, Rocio Andiola of Mesa, said this is the second trip she has made to Washington to urge Congress and the president to enact comprehensive immigration reform. This time, Andiola said she wanted Canales to know she was proud of her courage. “The love for her husband made her do this,” Andiola said. 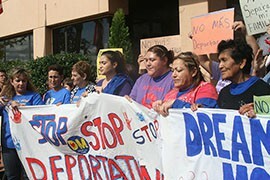 A dozen Arizona residents, upset with President Barack Obama's failure to act on immigration reform, took their protest to the Democratic National Committee. Cronkite News' Justin McDuffie reports from Washington. 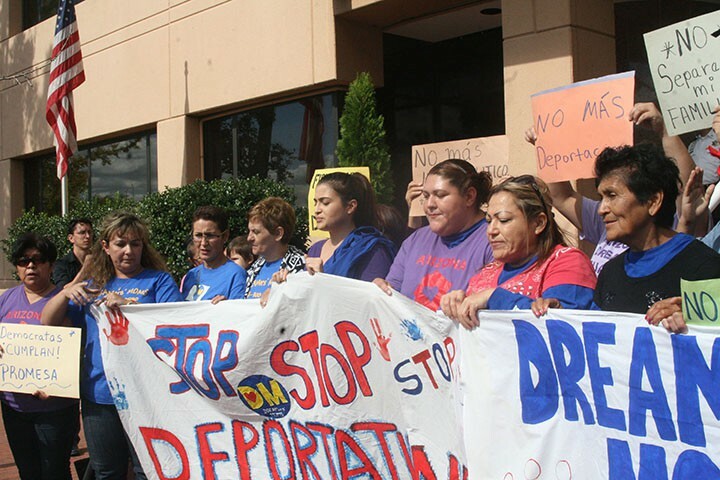 Arizona residents Andrea Adum, fourth from right, and Mayra Canales, to her left, were arrested at an immigration reform protest at the Democratic National Committee. Mayra Canales, center, and others protest the lack of action on immigration reform outside Democratic National Committee headquarters. Canales was later arrested in the protest.